As a truly translational area of biomedical investigation, epilepsy research spans an extraordinary breadth of subjects and involves virtually every tool that modern neuroscience has at its disposal. The Encyclopedia of Basic Epilepsy Research provides an up to date, comprehensive reference for all epilepsy researchers. With an expert list of authors, the encyclopedia covers the full spectrum of research activities from genes and molecules to animal models and human patients. The encyclopedia's electronic format also provides unparalleled access to frequent updates and additions, while the limited edition print version provides another option for owning this content. The Encyclopedia of Basic Epilepsy Research is an essential resource for researchers of all levels and clinicians who study epilepsy. 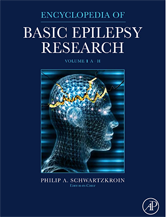 * The only comprehensive reference for basic research and current activities in epilepsy. * Electronic format provides fast and easy access to updates and additions, with limited print version available as well. * Contains over 85 articles, all written by experts in epilepsy research.